Well, we’re a month into the new year! Here at PVBid, we’ve started the year off really well. Our Estimating Service has been a huge hit – we even have clients who are partnering with us as their only estimators. The software is developing in awesome ways and we’re getting great feedback from our customers. This comes just in time – with the new tariffs on solar panels the leaner and efficiency benefits of PVBid are becoming more vital. Overhead costs – scale without increasing your overhead. Soft costs – reduce the long turnaround times. Cost of focus – keeping the talent focused on what they do best – selling and building. Reach out to find out more. Well, 2018 started off interestingly. On January 22, Trump announced that he will be placing tariffs on solar panels. Check out this article also carried by Solar Power World. Looking back on popular blog articles, the Scope Drop article is the most popular. 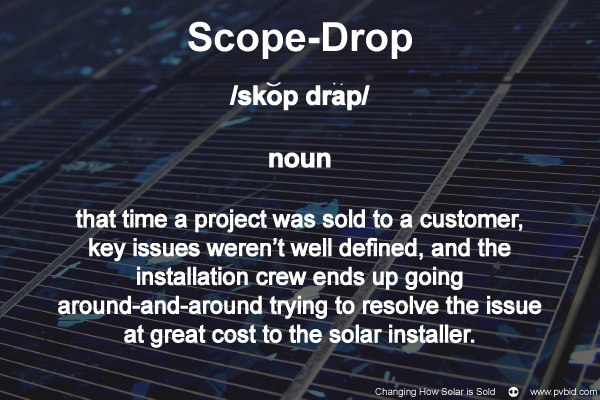 If you work in the solar industry, I’m sure you’ve experienced project scope drop. Does this sound familiar? A customer chose YOUR bid! The customer and the salesperson may have missed defining key issues….